What: the ASAC Dies, our 92nd birthday! Is your flux capacitator broken, the door of your TARDIS doesn’t shut and your hippogriff accidentally swallowed your time turner? No problem, the ASAC has you covered! 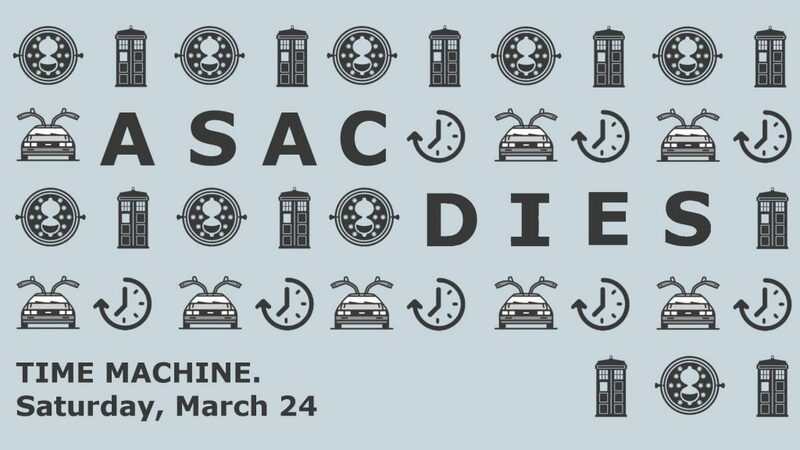 On March 24, the ASAC Dies Party takes you back (or forward) in time! Dress up as a character from your favourite time period – be it a decade of the 1990s, the future, antiquity or that time the Dutch football team won the European Championship in 1988. You can sign up either just for the party or for having a delicious dinner served to you before to get you ready for the time travel. From 18.30, we will be having a BBQ in front of Sportcentrum Universum (Science Park 906). The party then starts at 22.00 at Klimmuur Centraal (Dijksgracht 2). DJs and the famous ASAC band will be providing music all night long!